5 Must Have Travel Gadgets This Summer | Sharknova - Breathtaking travel stories, photos, videos and lists. Trunkster is creating a buzz in the luggage design industry, with sleek suitcases that dispense in favor of a roll-top sliding door. There is also an integrated digital scale, durable handle, removable battery, and a global tracking device (just in case!). The seductive design is definitely worth the splurge, with a retail price of $355, for the convenience and appeal! The ORGO Lite is an expandable case that pretty much serves as a portable counter. Unzipped, it spans across most sinks to create space and zipped up, it fits easily into your carry-on. The interior compartments are designed to hold all of your essentials in place next time you spring for a budget-friendly mirco hotel. The suggested retail price is $39.99. 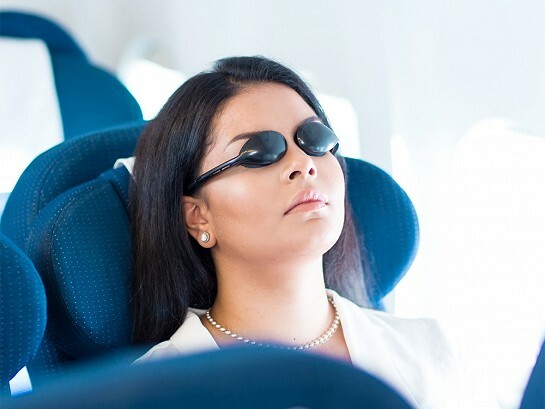 Occles are said to completely block the bright rays if you aim to catch a nap during a daytime flight, even with such an oddly shaped figure. Use Occles to keep the UV rays out as well when sunbathing. Light, durable, and bridgeless (to avoid a tan line across the nose), the eye covers are padded with soft rubber and adjustable for a wide range of head sizes. The futuristic eyewear retails for $31. With so much new music coming from the industry’s top artists and the plethora of music festivals around the world, quality bluetooth speakers is something you just can’t live without! The UE ROLL Bluetooth Speaker is the best of its kind for those chill days by the beach or late-night under the stars. It combines above-average sound quality with a waterproof, travel-friendly design that slips into any piece of luggage with ease. Nothing compares to UE ROLL’s all-around combination of sound quality, design, utility, and prices under $100! This teardrop shaped satchel molds to the shape of your body, to combat weight stress, back problems and encourage better posture. With a non-slip strap to keep it in place, the Healthy Back Bag distributes weight across the back, making it feel as if you are wearing nothing at all! Prices range depending upon size and fabric.